All Saints' Church, a landmark at one end of the High Street. 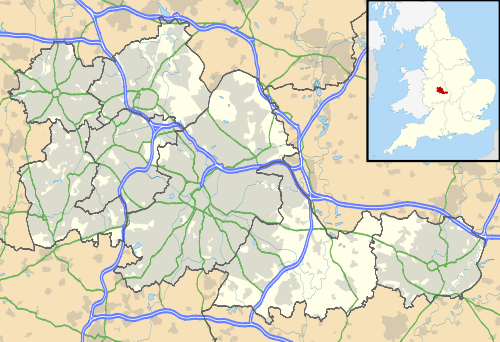 Bloxwich is a small town and civil parish in the Metropolitan Borough of Walsall, West Midlands, England, situated in the north of the borough and forming part of the Staffordshire/West Midlands border. Bloxwich has its origins at least as early as the Anglo-Saxon period, when the place name evidence suggests it was a small Mercian settlement named after the family of Bloc (Bloxwich, earlier Blochescwic, meaning "Bloc's village"). Some 19th century works suggest that at one time Bloxwich was a settlement in the ancient manor of Wednesbury. There is no conclusive evidence for this and Bloxwich has since at least medieval times been associated with the manor and town of Walsall (which for reasons unknown does not appear in the Domesday Book of 1086). Bloxwich itself is however mentioned in this book under the name 'Blockeswich'. 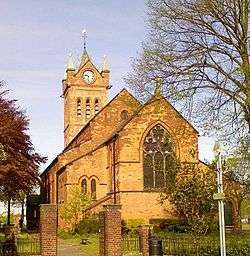 Traditionally there has been a strong rivalry between Bloxwich and Walsall with origins as early as the English Civil War, when Walsall was Parliamentarian in sympathy and Bloxwich, centre of the Foreign of Walsall, was Royalist. This situation was exacerbated by disputes over local taxation for the poor rate in the 17th and 18th centuries. Being part of the Black Country, Bloxwich grew rapidly in the 18th century around coal mining, iron smelting and various manufacturing industries, as part of the Industrial Revolution. Manufacturing in the area consisted of bridle bits, stirrups, keys, cabinet locks, plane irons, buckle tongues, chains and saddles. Its most famous product of manufacture were awl blades, which it is reputed to have surpassed all other places in the United Kingdom in manufacturing. In the early 19th century, Bloxwich was still a village. Most of its inhabitants were employed in the newly founded mining and forging industries, as well as light metalworking. It is also known for its canals. Bloxwich was heavily developed between the wars for council housing. Most were constructed around Blakenall Heath, as well as Harden and Goscote. In the 20 years which followed the Second World War, the Lower Farm, Beechdale and Mossley estates were also erected as council housing developments, while the southern side of Harden was developed along with the Rivers Estate at Blakenall Heath. Many privately owned houses, mostly in the Little Bloxwich area, were also constructed. In the 1990s and 2000s, many new housing developments have sprung up both in Bloxwich and at Blakenall Heath. Bloxwich has in recent years completed numerous redevelopment projects. Bloxwich Police Station, opened in 1884 on Elmore Green Road, was closed for reconstruction in 2000, and reopened by Princess Anne on 26 September 2002. (It also has responsibility for Willenhall and Darlaston.) The market square, library and job centres have also been refurbished. Bloxwich town centre is still mostly made up of Victorian and Edwardian buildings and leafy parks and gardens, which maintain its origins as a Staffordshire village. Good built examples are Bloxwich Hospital, Bloxwich Hall, All Saints' Church and several private houses in Station Street, Stafford Road, Wolverhampton Street and Sandbank. From the Georgian period to the 1960s, Bloxwich had more public houses than any other town in the Metropolitan Borough of Walsall, though these have begun to disappear. However, its jewel in the crown still resides there: The Turf Tavern, a grade II listed building, is, according to CAMRA: "The last truly unspoilt terraced pub left in the country..." A focal point is the well-known Bloxwich Fountain in the Promenade Gardens. The church contains the original cemetery which dates back to the early 18th century. Beyond Bloxwich Golf Club, Yieldfields Hall, to the north of the town on the A34 marks the northernmost edge of Bloxwich, Walsall and the West Midlands, currently the border with Staffordshire. The postcode for Bloxwich is WS3, it also covers the suburban centre of Pelsall. Bloxwich is well served by public transport and is home to two railway stations, Bloxwich and Bloxwich North. Very regular buses link Bloxwich with Walsall, whilst others link the area to the surrounding towns of Wolverhampton, Bilston, Willenhall, Brownhills, Wednesfield, Cannock and Hednesford. Other local services serve nearby estates of Coalpool, Harden, Mossley, Lower Farm, Goscote, Leamore, Beechdale, Dudley Fields, Landywood, Essington and Pelsall. Three peak only services link Bloxwich with Birmingham. Roadwise, the A34, Southampton/Oxford/Manchester road, goes straight through the town and forms its High Street. Most shops are based on this linear development. The A4124 Wolverhampton to Brownhills road crosses to the north of the town. Bloxwich is four miles from the M6 motorway between junctions 10 and 11. Rob Halford (born 1951), lead singer of seminal heavy metal band Judas Priest, who still owns a house in Walsall despite being resident in the USA. Tom Major-Ball (1879–1962), music hall performer and father of former Prime Minister John Major. Arthur Tolcher (1922–1987) Lived his life with home always being a council house in Broad Lane, Bloxwich. Virtuoso British harmonica player and child star of the 1930s. Achieved fame later on the Morecambe and Wise Show. He would come onstage in evening wear and start to play his harmonica (always España Cañí/Spanish Gypsy Dance), only to be stopped by Eric and Ernie saying, "Not now, Arthur!" Comedian Meera Syal grew up there. ↑ "Bloxwich East Ward population 2011". Retrieved 19 December 2015. ↑ "Blxwich West Ward population 2011". Retrieved 19 December 2015. 1 2 Ernest James Homeshaw (1955). The Story of Bloxwich. Geoff J. Clark Ltd. p. 281. 1 2 Edward Lees Glew (1856). History of the Borough and Foreign of Walsall. J.R. Robinson. p. 75.